As your Columbus, Ohio contractors we like to stay on top of the latest technology trends, so we can then share them with you! This also might help as a last minute gift guide for any procrastinators out there…ahem ahem. Did you know there are fridges that stream Twitter updates, washers and dryers you can program from your phone, thermostats that learn your schedule, and more? 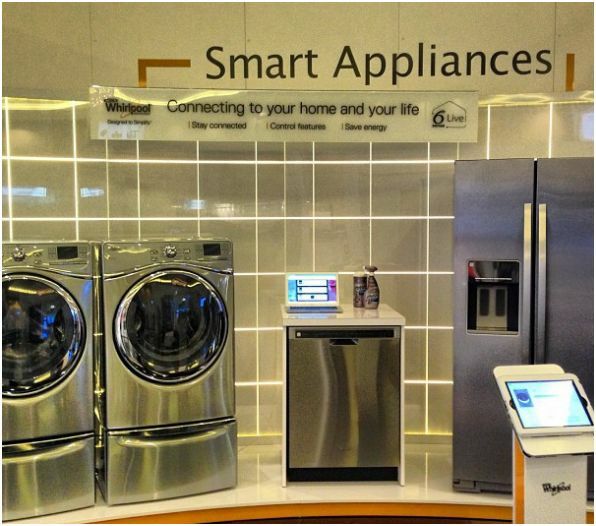 This year the connected appliance category is only growing, with all the big manufacturers showcasing how you can integrate all your devices and streamline your routine using the cloud and your mobile phone. In the very near future you may soon be able to control everything from one app, and some outlets are trying to make this reality. For instance, Lowes’ Iris home connectivity hub helps bring everything from your home security system and lighting to your appliances together into one easy-to-access place. Who doesn’t love when things are all in one place? One of the things we are experts on since we are your preferred home remodeling company, Columbus, Ohio…is destruction (wait, we are good at both destruction and Reconstruction). At any rate, this year promises to offer some amazing smart phones that are virtually indestructible. Did you know they now make phones with flexible screens? These bendable displays are less likely to break, for obvious reasons. Also, there is the next generation Gorilla Glass 3 that promises to be even more resilient against scratches. Another cool compenent, a company called Liquipel has nano-technology that coats phones to make them water resistant. Ground-breaking gadgets are not exactly always known for their design, but some of the most recent technology is trying to blend in with your décor, instead of being an eyesore. From HDTVs that look like sculptures, to wireless blenders that keep your countertop clear, it looks like technology manufacturers are definitely keeping aesthetics in mind. Whether you are looking for a last minute gift, or just thinking ahead to your next residential renovation and what gadgets you can put in it, NJW is here to help!